G. A. Miller and Robert Clark guide year round for stripers that reproduce almost too well on Lake Texoma and need to be harvested for the dinner table. 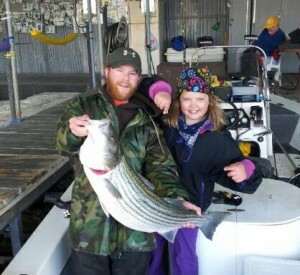 Live bait is the most productive method to catch stripers, and is what they use the majority of the time.. However, G.A. and Robert fish with various types of lures when they are working best. There is nothing more exciting that a huge striper blowing up on a top water lure in the summer, and fishing slabs and jigs can be a blast as well. G.A. and Robert guarantee success whatever the method, for both beginners and experienced anglers alike. You may use the form below to have them to contact you. Please list your preferred contact method in the comment box. For pricing information, please click here.